One more defeat and they tie the record set by the Tampa Bay Buccaneers who lost the first 26 games of their existence in 1976 and ’77. Was LeBron James that good? Well, yes and no. Yes, in that the team had grown to rely on him to an uncomfortable degree, stifling the development of other players. Also, when he left he took Zydrunas Ilgauskas, a key role player, with him. And they both left late in the free agency period, leaving the Cavs with little opportunity to make improvements to their team before the season started. 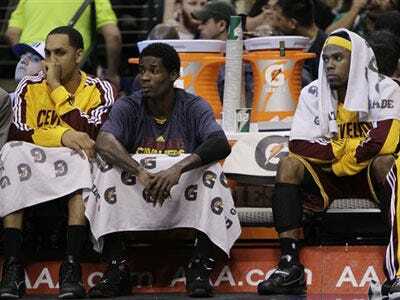 LeBron’s departure was not just a blow to team psychology and talent, it was a strategic blow as well. At least they’re holding up better than Michigan State. You know your season is bad when you’re getting pep talks from Dan “Comic Sans” Gilbert. Tom Izzo passed up the chance to coach this horrible team, but given the way his Spartans have collapsed this year, it may not have made any difference.